"I injured a rock! I murdered a brick! I'm so mean, I make medicine sick!" Having been much impressed by the documentary "When We Were Kings" I was very happy to pick up one of Mego's best-Muhammad Ali. I'm not a huge boxing fan, but you don't have to be to appreciate Ali. There has been much said about this towering figure in recent American history, and I'm really not in a position to add anything else, but I do admire the hell out of a sports hero who had fierce principles and who stood up for them without apology, regardless of consequences. Arrogant, talkative athletes are nothing new, but few of them today go beyond "Show Me The Money", "Stay in school", and "Don't do drugs". 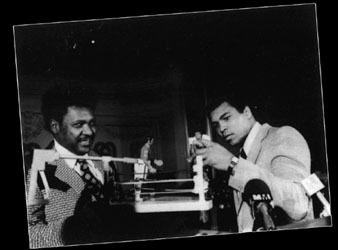 Ali put his money where his mouth was, losing his title and three years in his prime for refusing the draft and condemning the Vietnam War. Further, the outspoken Champion was blisteringly frank in his opinions on race, and no amount of titanic celebrity and popularity could change that. "ALI! BOME YE!ALI! BOME YE!" The figure's fighting action is controlled with a trigger mechanism that snaps into his back, as pictured on the back of the card (left). The action is a little awkward. 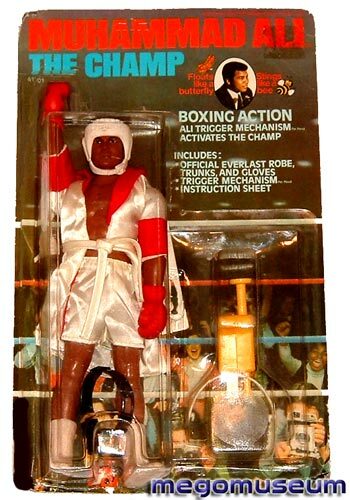 The action also worked with the Boxing Ring play set, pictured below. According to the Bonavita Book, they didn't sell many play sets at all, so they are hard to come by. 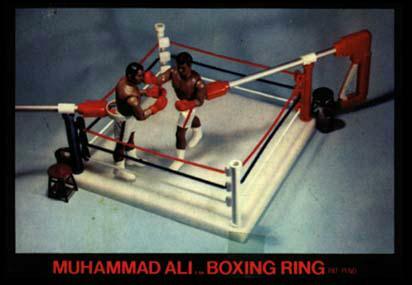 The play set included the Ring, Ali, and an Opponent modeled after Ken Norton. This photo features prototype opponents that were not produced. 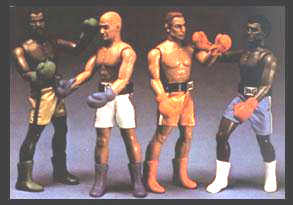 The one on the left, "Manila Mauler" was modeled after Ken Norton...The others are "Lightning Lefty, The Carrot Kid" and "Battling Ben". 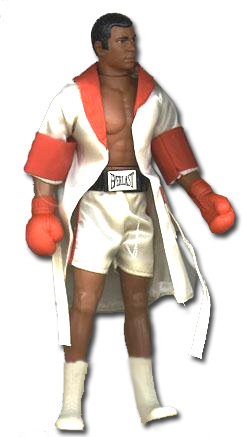 Carded example of Mego Ali. This is just one of the many ways he came packaged. If you look closely you can see Mego President Martin Abrams making a cameo as a camera man. Mego changed the cards on the figures a number of times. 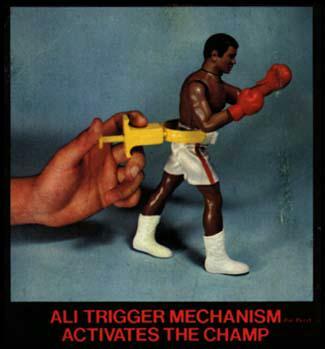 Foreign distributors such as Grand Toys (Canada) released Ali (although the line sold poorly in Canada as well). 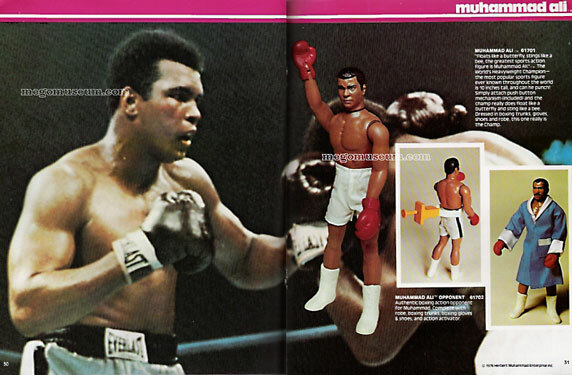 Denys Fisher (UK) and Toltoys (Australia) released Ali in a box, these two companies often shared such items.